Finished her senior season with a 22-12 singles record and 25-12 doubles mark…First Team All-ACC, becoming just the third Seminole to make All-ACC four times…ranked as high as No. 31 in the ITA rankings, tying a career high from her freshman season…beat 10 ranked opponents on the season en route to her second NCAA Tournament appearance (first singles), falling in the first round…in the fall, went 7-4 in singles and 10-4 in doubles…ranked No. 66 in the preseason singles rankings…beat three ranked opponents, including No. 59 Gabby Smith and No. 35 Paige Hourigan in the qualifying consolation at the All-American Championships…three of four losses were against Top 30 opponents…in doubles, won four matches in prequalifying and qualifying at the All-American Championships with fellow senior Yukako Noi…with that run, Borthwick and Noi rank No. 41 in doubles to open the season…represented the United Kingdom at the 2015 World University Games. Played every match on Ct. 1, finishing 15-8 on the season and 8-6 in ACC play…went 6-9 against ranked competition…went 12-11 in doubles play, including 10-10 on Ct. 1 playing with Yukako Noi (5-4), Kerrie Cartwright (3-4), and Emily Fanning (2-2)…went 3-1 in the ACC Tournament, including a 4-6, 7-5, 6-3 victory over No. 102 Johnnise Renaud of Georgia Tech…ran off an eight-match win streak midseason that included another ranked win over Renaud…did not drop a match during the streak…made the All-ACC Academic Team for the third season and named the Southeast Region Most Improved Senior of the Year winner by the ITA…All-ACC Third Team…ACC Academic Honor Roll and ITA Scholar-Athlete…posted a 6-7 singles record and a 6-6 doubles record during the fall season…had three wins over ranked opponents…defeated Florida’s No. 51 Kourtney Keegan (0-6, 6-3, 6-4), Texas Tech’s No. 113 Kenna Kilgo (6-1, 6-2) and Arkansas’ No. 121 Shannon Hudson (7-6 , 6-0)…won her first four matches at the Riviera/ITA All-American tournament in California…was preseason ranked No. 9 in doubles by the ITA with partner Kerrie Cartwright…played with Emily Fanning in the USTA Collegiate Clay Court Invitational presented by VISIT FLORIDA at Disney’s Wide World of Sports complex…won their first three doubles matches to reach the finals…fell to Auburn’s No. 30 Michala Kucharova and Reka Muller in a three-set thriller (6-7 , 6-1, 0-1 ). Earned All-ACC Third Team honors with a 15-10 singles record, including three wins over ranked opponents…finished the season with a 14-6 mark in doubles, including a 13-5 record with partner Kerrie Cartwright as they defeated three ranked pairs and qualified for the 2014 NCAA Doubles Championships…won nine doubles matches in a row from March 17 to May 9 with victories over Clemson’s No. 26 Yana Koroleva/Beatrice Gumulya (8-5) and Virginia’s No. 11 Julia Elbaba/Rachel Pierson (8-6)…Borthwick and Cartwright were ranked as high as No. 30 by the ITA before ending the season at No. 32…recorded three separate win streaks of at least three matches – Jan. 31 to Feb. 8, March 2 to March 9 and April 13 to April 24…had eight singles wins on court one and seven wins on court two…her most memorable singles win came on court two as her 7-5, 3-6, 6-2 victory over No. 106 Kim Stubbe of Arizona clinched the Seminoles’ upset victory over the No. 27 Wildcats in the first round of the NCAA Team Championships…ranked No. 46 during the fall and posted a 5-4 singles record, including a 2-1 record over ranked opponents…finished with a 2-5 mark in doubles…played in the qualifying draw of the Riviera/ITA All-American Championships and defeated No. 66 Sarah Pham of Utah in three sets, 7-5, 5-7, 6-4…was ultimately eliminated by Yang Pang of Arkansas, 6-3, 3-6, 7-5…competed well at the USTA Clay Court Invitational at Disney, reaching the quarterfinals by defeating Texas A&M’s Paula Deheza and Florida’s Stefani Stojic. Played most of her matches on court one…was named to the All-ACC team in 2013…played 26 singles matches against ranked players and posted an 18-16 record overall…was named ACC Player of the Week after FSU’s wins against USF’s Katie Vasenina (No. 35) 6-4, 6-4 and Miami’s Kelsey Laurente (No. 52) 7-5, 4-6, 7-6…the win over Laurente lifted the Seminoles to a 4-3 victory over the Hurricanes – the fifth in program history…was 16-16 in doubles…while paired with Francesca Segarelli the duo defeated the No. 52 pair of Caroline Price and Whitney Kay of UNC 8-4…was ranked in every single ITA poll in 2013 and peaked at No. 31 before finishing out the season at the NCAA Championships at No. 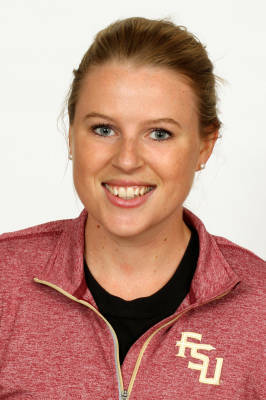 62…without even playing a match as a Seminole, Borthwick was selected to play in the prequalifying rounds of the ITA/Riviera All-American Championships in singles and doubles…made her FSU debut by defeating No. 18 Brynn Boren of Tennessee at the Furman Fall Classic, which remains her highest-ranked win…defeated two more ranked opponents in No. 86 Chanelle Van Nguyen of UCLA and No. 49 Alex Cercone of Florida…rated the ninth-best newcomer according to the ITA…finished the fall with a 12-4 showing in singles while going 7-6 in doubles. Qualified for the 2011 Junior Championships at Wimbledon, advancing into the third round…was a member of the U-18 Great Britain team for the Maureen Connolly competition, which is set up as Great Britain vs. the U-18 American team…represented Great Britain during the U-16 IC tournament…Borthwick attended the Nelson Thomlinson School where she played netball, hockey, cross country and participated in athletics in addition to tennis. Born May 14, 1993…daughter of Tom and Linda Borthwick…father Tom played semi-pro rugby and is now a coach for Tynedale in National division 1 and also served as a coach for England Counties on their tours from 2000-2002 and 2009-2010…graduated with degree in sport management in 2015 and working towards a Master’s degree in sport management.